The dojo - the training hall - is an austere, plain structure: unadorned walls, smooth floor, matted and well lit. 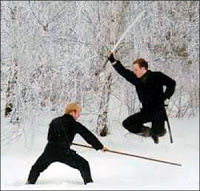 For these reasons, the traditional dojo doesn't accurately represent a realistic setting for a confrontation. Maybe some schools should include bar stools and pool tables as part of their training equipment. If "combat effectiveness" is what you're looking for in your art, then concepts besides developing techniques that only work in a pristine, flawless martial arts school need to be considered. Have you ever trained outdoors or in an unfamiliar environment? Obstacles can and do get in the way, such as an alley wall or a depression in the ground. Having to defend yourself on the side of a hill or during inclement weather is not only challenging, but could get downright ugly. Attacks can happen in the most unlikely surroundings. Most robberies and confrontations take place at night. During Okinawan karate's formitive years, secretive training took place after sundown. As such, fighting techniques were developed with only the aid of moonlight. These same practitioners trained on the beach with eku (boat oars), and used their makeshift weapons to flick sand into the eyes of their adversaries. The master duelist Miyamoto Musashi would make it a point to keep the sun to his back during his bouts of mortal combat. If fighting indoors, he would plan the possibility of escape if necessary, previewing the area for doors, windows, or other avenues of exit. Musashi felt that escaping from overwhelming circumstances was compatible with warriorship, and was simply a part of effective strategy (heiho) . Live to fight another day. Use everything to your advantage at all times. I've been lucky enough to train outside a bit during summer. It's incredible how the ground - with bumps, holes and other things - can distract you. Suddenly, you're off balance. Would those have been real fights, I'd have lost my life at least... 4 times because of my inability to cope with the terrain. Training in a new and different environment can really show you the weaknesses in your techniques or strategy in a hurry. Contrariwise, if you get used to the idea of adjusting for your environment you can learn to use it (even things that would seem a problem) to your advantage. Case in point, when my husband was paired up to fight in the dark, he initially found his popping ankles a huge disadvantage (half the challenge is finding your opponent). But then he had a lightbulb moment. He stuck a leg waaay out (big, long-limbed guy), and deliberately popped his ankle loudly, then backed up about a step and waited. Sure enough, his opponent zeroed in on the sound, and Rob was right there waiting for the kill. Sensei dubbed him the "Arthritic ninja". I train in my front yard fairly regularly, and it's good practice, as well as entertaining for the neighborhood kids - particularly when I'm learning a new weapon! I learned about how training outside the "safety" of the dojo can be beneficial when I was doing jo kata with my sensei in the parking lot above our school. I slid my feet, as I did on the mat. But asphalt is not tatami, and I quickly tripped forward and fell. Now, even when I'm on the mat, I mind my footwork. Sliding around may look cool... but it certainly isn't practical. Training in the snow is another fun challenge... but that's another story! How about trying to train in you house with a low roof. A reset button for living. ...if you get used to the idea of adjusting for your environment you can learn to use it to your advantage. That was exactly Musashi's point. Also, one version of the Isshinryu kata Kusanku (a "nighttime" kata) utilizes a foot stomp in the opening sequence that represents a distraction - similar to your husband's amusing but clever ploy. Ueshiba did some of his training in the woods, mountains etc.. I have photos of this in one of my John Stevens (renowned aikido author) books. For me, mats are a little difficult to pivot on. But if you get some perspiration on them, then you go flying! That's the only time I miss a traditional wooden deck. First you train with your sword in a public park, now in your house? You should get your own reality TV show, Eddie! How about jousting on snowmobiles? (I live in Michigan).